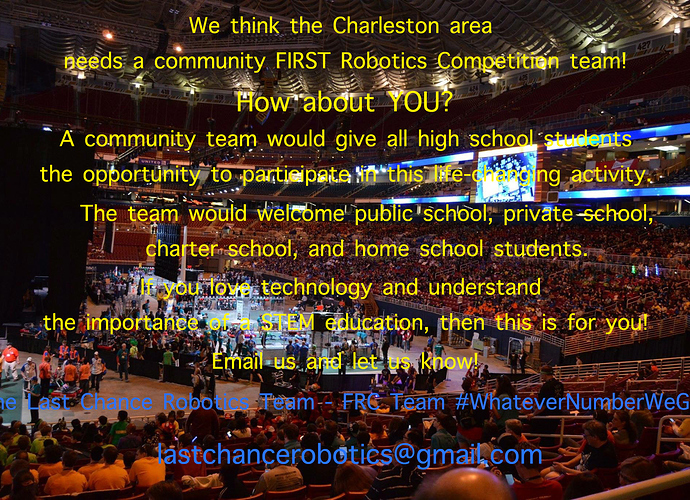 We are trying to establish a new FRC team in Charleston, South Carolina open to all interested high school students in the area. If you know someone who might have an interest, please have them contact us! Email lastchancerobotics@gmail.com or PM us on CD. Have you reached out to local newspapers, radios and schools? I have no idea when school ends in Charleston, but it would be ending soon or have already ended so I recommend trying to reach out to school administration as soon as you can. It’s awesome that you are starting a new team! I wish you luck, Last Chance Robotics. I’m now an ex-South Carolinian, but I like to think I’ve still got my finger on the pulse of things down there (I’ve only been gone two and a half weeks!). Speaking of FTC, give it some real consideration. 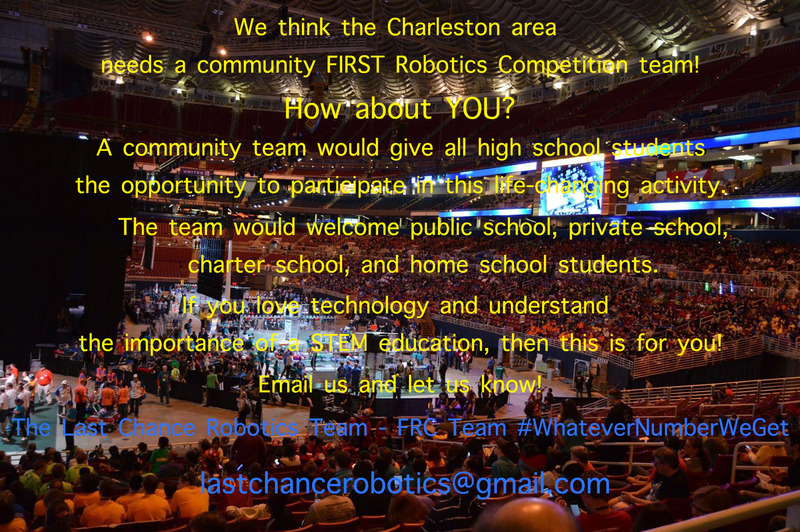 It’s not as established as FRC in South Carolina, but it can be a great way to step in the game with a smaller crew and ramp up. (If you’re planning FRC, you’re already getting used to robot obsolescence–an old FTC robot isn’t going to hurt you.) Garnet Squadron almost started that way. There are several Charleston-area teams already. 342, 3489, and 3490 are the most prominent, but there are many more. (I count seven from the Charleston/Mt. Pleasant/Summerville area.) 4083 lists “Neighborhood Group” as one of their youth organizations; perhaps they’re worth falling in with? I don’t want to dissuade you from starting a team–but as one of the two cofounders of Garnet Squadron, I can say that only deciding to uproot myself after 30 years in South Carolina to take a job in Indiana has caused me to lose more sleep. It is hard work, it is terrifying, it is rewarding if it works…but if you can find a way to serve a community with an existing program, that is absolutely the way to go about it.